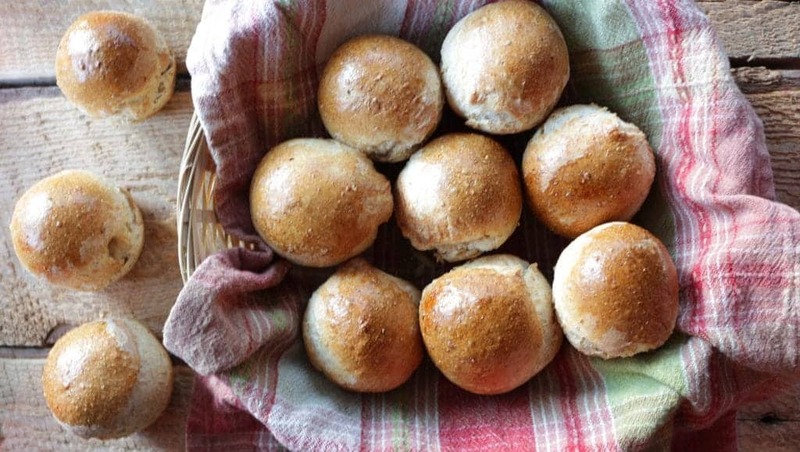 These homemade dinner rolls are slightly crusty, fibrously delicious, with tender insides. 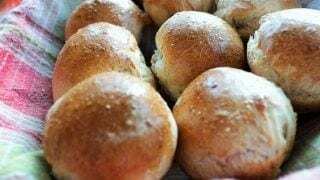 Perfect for serving with a hearty soup, like Hambone or Cabbage patch soup.These tasty homemade rolls compliment many entrees. I’m an occasional, seasonal, yeast bread maker. I bake bread for toast and sandwiches in the colder, less busy months. Homemade dinner rolls, and the occasional sweet treat like monkey bread from Scratch graces my kitchen occasionally. 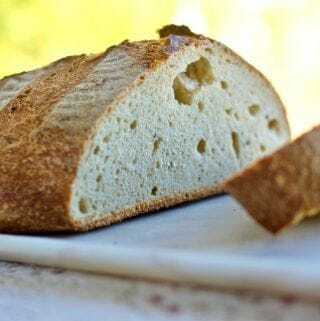 I’ve learned a few things I’d like to share with you about baking yeasted breads. Here are Some Bread Baking Tips that will help you out. Proof your yeast! I have some yeast that has been in my fridge freezer for years. It’s STILL active! But I always check it by proofing. My Large block of Red Star yeast came from Costco. I’m a seasonal baker, so I don’t use it up as well as I could in spite of my good intentions. If you have any question about the activity of your yeast; proof it. Here’s how: Put a teaspoon of yeast in a bowl with warm water(about 110 degrees F.) and let it sit 10 to 15 minutes. It should be creamy, cloudy and rise to the top of the water in a foamy mass. This means it’s active yeast and will do a good job of raising your dough. If your yeast is inactive(it sits at the bottom of your bowl) throw it out and get some new. Without good ingredients yeast breads are a fail from the start! You need active yeast and fresh, good quality, hopefully organic, flours. If you’re trying to use really old flour you may not get good results. 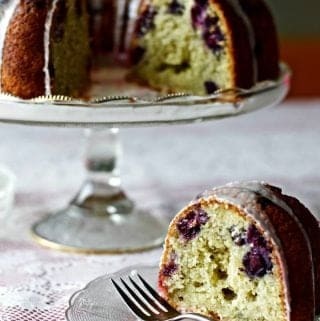 The yeast sponge in this recipe is fast rising and uses whole wheat flour for extra fiber. A longer sponge recipe, like the one I used for my cinnamon rolls is preferred if you have the time and forethought to make the starter at least 8 hours ahead. This may improve your rolls flavor and texture. I like a fibrous roll but not a tough one. These are really just about right. A nice crusty, but not tough, roll with a tender inside. You can see the flecks of flax and whole wheat in these rolls. They have a nice, nutty flavor from the flax and whole wheat that compliments soup really well! This ole Bosch International is what I use to make my yeast breads. My mom gave this to me a long time ago (25 years I think) when I was making bread for a family of seven on a regular basis. It mixes and kneads the dough for me really well. I LOVE that! Now a days I love letting my [easyazon_link identifier=”B0093NO0U6″ locale=”US” tag=”homefoodjunk-20″]Bosch machine[/easyazon_link]do the kneading. It’s a workhorse for bread making. I do recommend hand kneading your dough if you’ve never made bread dough. Going through the stages of gluten formation with your hands on the dough will help you feel the texture get more resilient as you knead. I learned to bake good bread on a wood cook stove many years ago. I baked that way for two years. I learned a lot about baking from that wood stove. 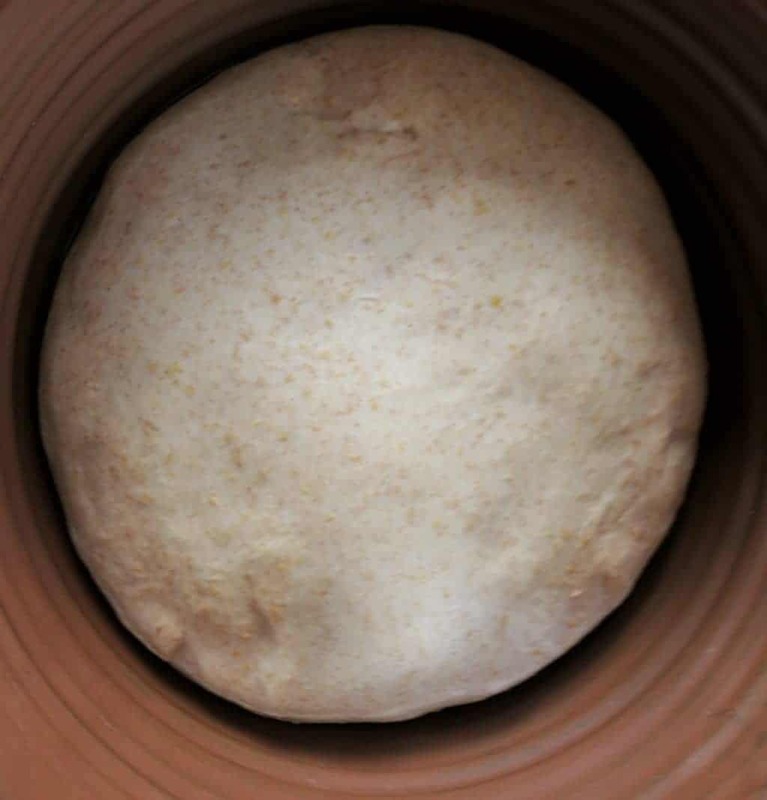 You need to understand what a dough feels like as it goes through the different stages of gluten development. Learn How to check the dough for doneness so you can take it out of your mixer(or quit kneading it by hand). Do the window pane test. I show you how in this post. Here’s a reminder for those of you that already know about it. Take a golf ball size piece of the dough out of the dough and stretch it between your two oiled hands. First off if it doesn’t stretch, but just breaks; keep kneading another few minutes. The dough needs to be resilient and stretchy. That means the gluten is developing. A must! Now go stretch it again until it is transparent like a window pane. It should not break. This is a well developed gluten and will give you proper rolls. Form the dough into a ball, oil it and place it in a large oiled bowl with plenty of room for the dough to double in size. Place the bowl in a warm place for an hour or so. Cover it with a towel to protect it from drafts or place it in your oven like I do, using my bread proofing function. 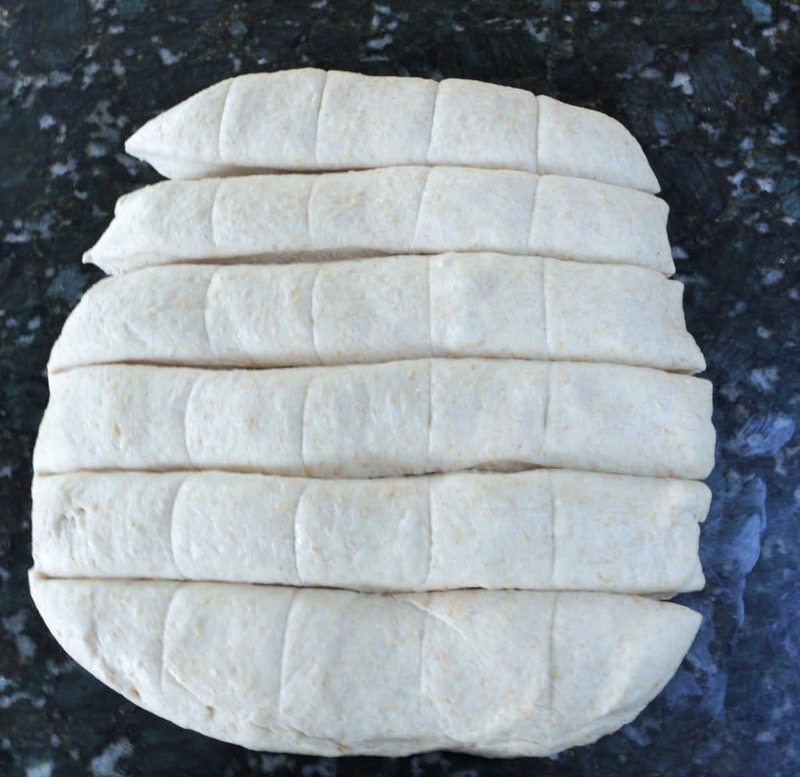 Place the dough onto your clean counter and roll it into a square. Cut it evenly into 24 pieces. Place a section of rounded dough (I pinch the underside together to get dough tension on the top and keep the finished rolls round and light) into a greased muffin tin. I made a pan of rolls and used the rest to make a loaf of bread. Brush the rolls with slightly beaten egg white and let them raise 20 to 30 minutes. Heat the oven to 425 degrees and bake for 15 to 20 minutes. Eat them with butter as soon as they cool enough to handle. 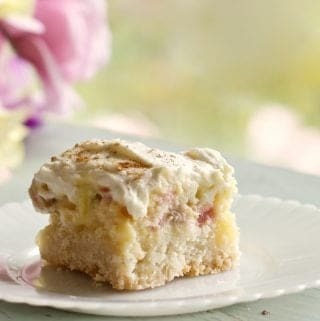 Or store, freeze and reheat in the microwave or oven to serve warm. 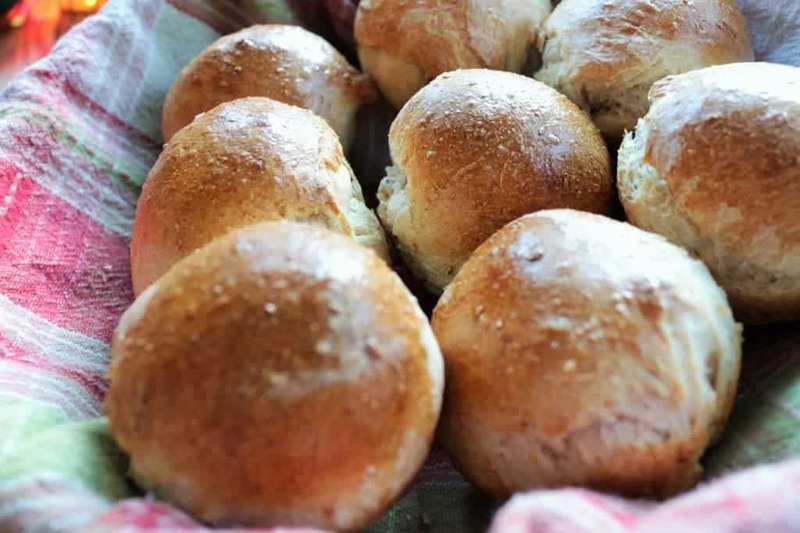 These homemade dinner rolls are slightly crusty and fibrously delicious, with tender insides. The perfect side dish to a hearty soup, meat dinner or anytime! 1/4 Cup warm water, 105-115 degrees F.
Proof the yeast by placing yeast in your stand mixer fitted with a dough hook and add the warm water. Wait until you see the yeast bubble up to the top of the water(It's proofed) and then add remaining sponge ingredients. Mix it a pulse or two. Add the remaining water, flax and whole wheat flour and one cup of the white bread flour to the sponge and mix on high for three minutes. 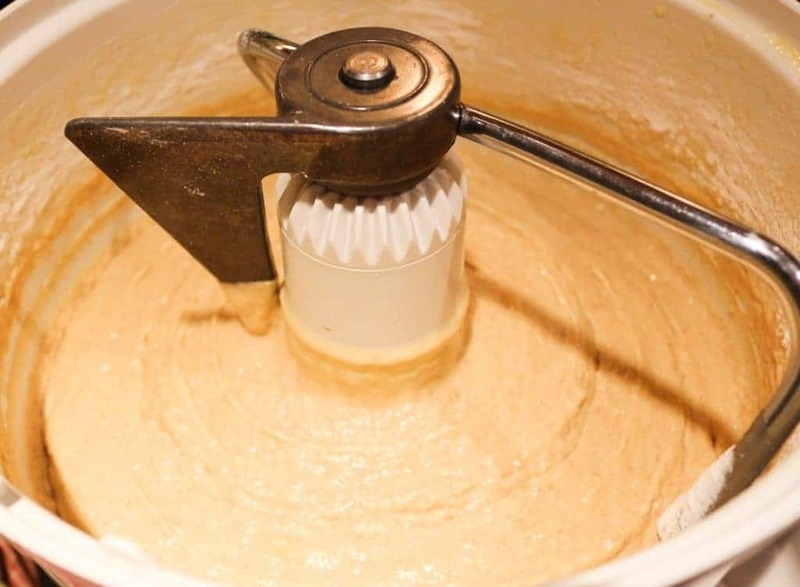 Reduce stand mixer's speed to low and add in enough flour to form a fairly firm dough. Mix the dough on low for 5 to 10 minutes until the dough clears the bowl sides and comes easily off the dough hook with little or no stickiness. Note different flours absorb water differently. Add more flour if it stays too sticky. Place the dough ball into a large oiled bowl, turn the dough ball until it's coated in oil and put the bowl in a warm place(about 80 degrees F.) to rise. (I use my bread proofing function on my oven). I did not cover the bowl in my oven but I oiled it. If you're placing the bowl onto your counter or other places with drafts. Place a towel over it. Set the timer for 45 minutes, check the dough and give it another 15 minutes if it's not doubled. Place the dough ball onto your clean counter and roll it gently into a square. You don't want to totally deflate the dough. Just roll it square and then cut it into 24 equal pieces. Brush the rolls with the beaten egg white for a shiny glazed look. Let rise 20 to 30 minutes. Serve warm with butter or condiments. Freeze these in ziplock Freezer bags with all the air sucked out. Freeze for up to two months. Serve these beauties warm with butter! Enjoy! Gosh I miss crusty rolls. 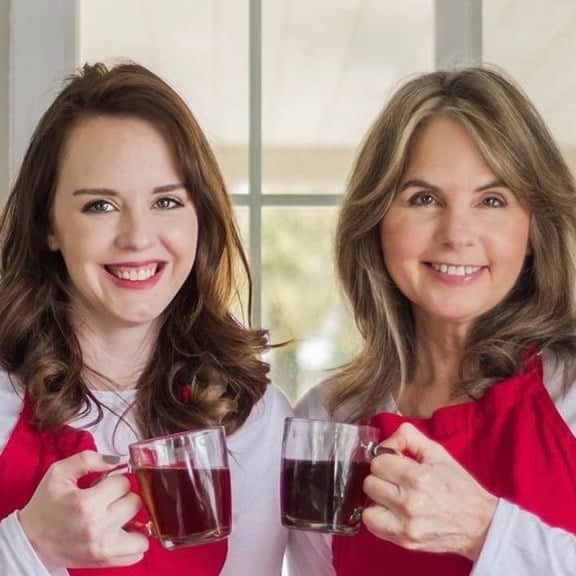 This recipe looks delicious and perfect for anyone’s holiday table. 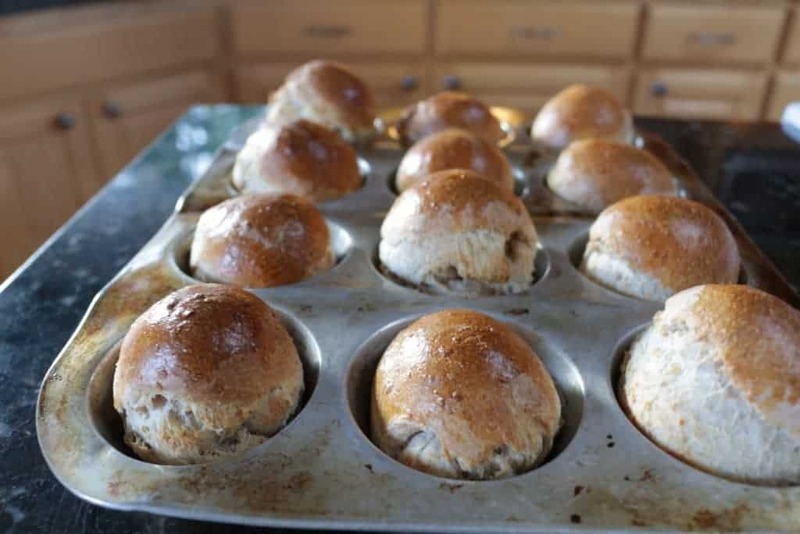 I love homemade dinner rolls, and these with their flecks of flax look so wonderful. They will just make the dinner so special! I am always so intimidated by making breads! But you make this look soooo easy! This looks like a nice easy recipe. I can’t control myself around dinner rolls. I just eat so many of them. I love the step by step directions you’ve given – it’s been a long time since I’ve baked bread so I appreciate the helpful hints! Your recipe sounds fantastic, like others, pretty sure I can smell them thru the screen! 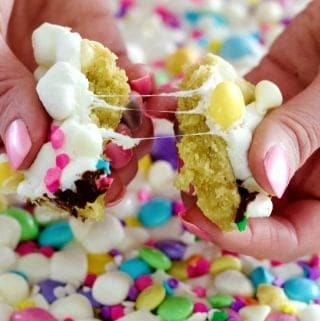 These are so easy to make and delicious with a meal Debra! Nothing can beat up the smell of homemade bread! These rolls look terrific! I have some left over grilled chicken in the fridge that would go great in your rolls. Shall we do a bit of a food swap? I’ll bring the rolls! Your grilled chicken would be excellent in these. Let’s do lunch! Your rolls look spectacular and I appreciate the lesson about yeast. MMm yum! 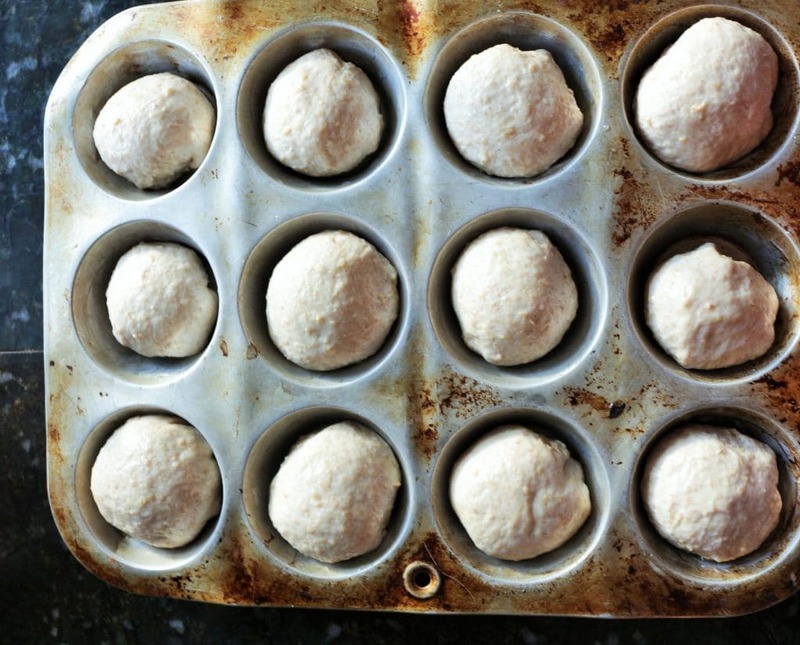 I love home made bread – and what a great idea to make rolls in a muffin tin! I have not baked bread in a while and after seeing this, I know I should resume and start with these delicious rolls! I remember your homemade bread Abigail. It was fantastic! I know you would love homemade dinner rolls as well! These are so tempting! There’s nothing better than hot rolls and butter. I agree KC! I love homemade dinner rolls! Do I need to have another dish if I make these because these look fabulous and like I’d want to eat the whole basket in one sitting! Thank you Kelly! They are delicious! Diane, I must try these dinner rolls. Appreciate what you said about using good ingredients for yeast and organic flour. These look fantastic. Thanks so much Suzy, for stopping by! I hope you make these dinner rolls. They are tasty!